The screenshot below shows wind speed near Mount Washington, which has the fastest winds in the US. Something interesting to look at as well are the wind corridors being formed in Florida at specific times. There are thousands of stations that capture wind speed, orientation and temperature with different time granularity. 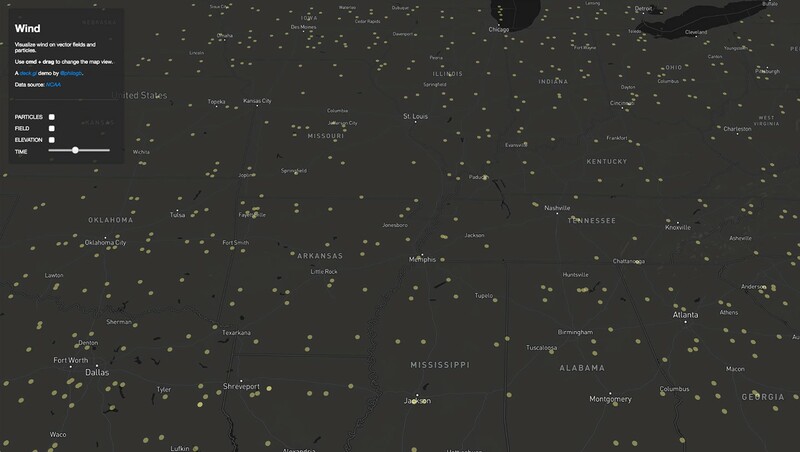 If you turn all layers off you’ll see yellow dots that represent each one of the stations we’re getting data from. 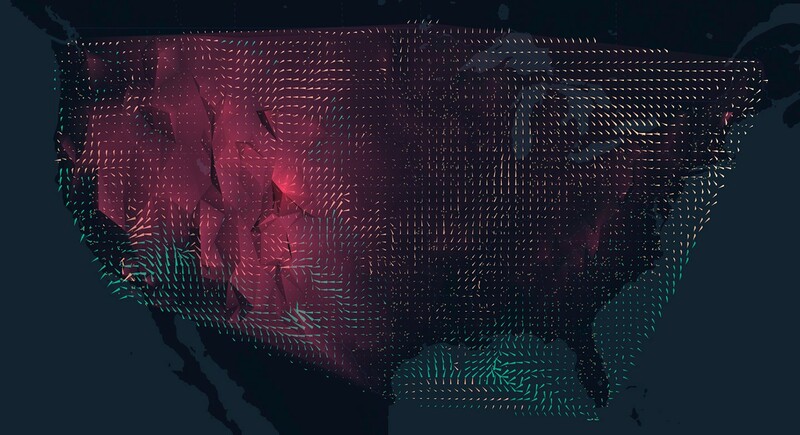 For this example though one of the challenges was to be able to get a uniform distribution of wind speed, direction and temperature that could be sampled at any point of the map, not simply at each station. In order to do this we created a Delaunay tessellation for the stations, and then rendered the mesh to a floating-point texture, to get GPU-interpolated values into an image. In this case we map wind direction to the red channel, wind speed to green, temperature to blue and elevation to alpha. Finally we used transform feedback, which enables us to only use the vertex shader for data processing and updating every particle’s position in real-time. 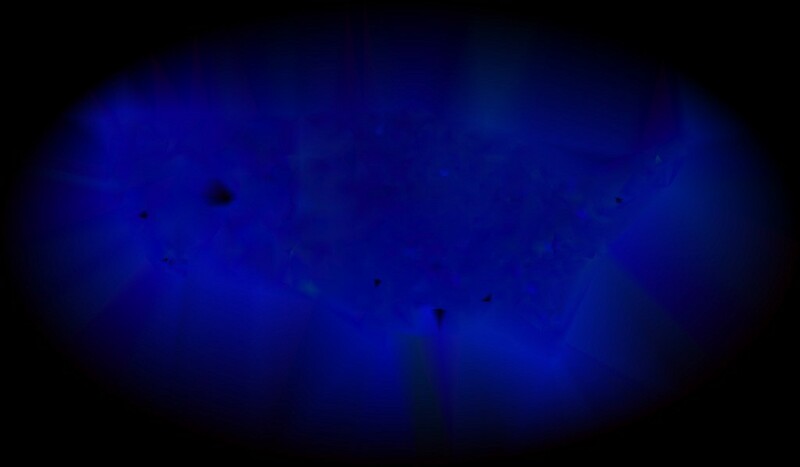 We throw a random sample of particles (~1MM) that get updated by the texture data, and then render those on the screen. Every particle has a TTL (time-to-live); when the TTL expires it gets repositioned at a random location on the map. Blending reveals where the biggest concentration of particles are. And that’s it! 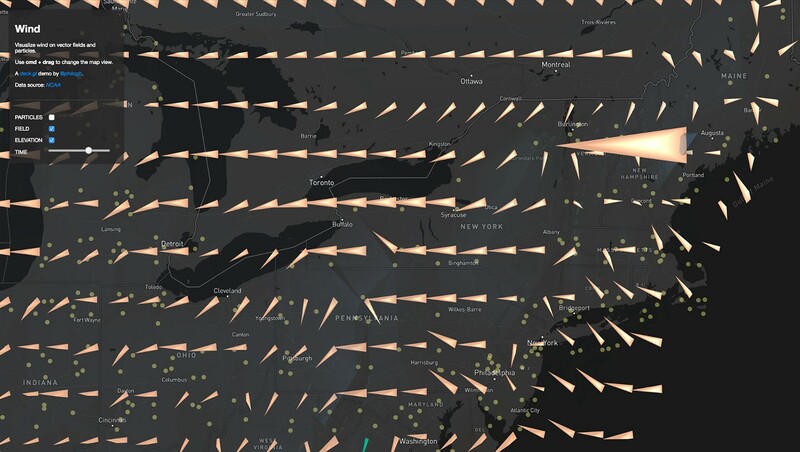 Three custom layers built with deck.gl to bring this wind map to life. Check out the example and feel free to provide feedback! Originally published at deck.gl on April 17, 2017.